Safe-keeping for little bits and bobs, including toiletries, hair ribbons and tiny toys. 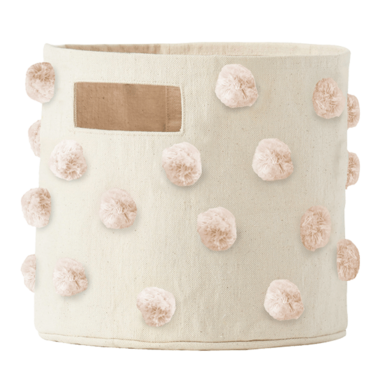 With each pom pom sewn on by hand, these pom pom pints are one of a kind, 100% heavyweight cotton canvas and measure 10"d x 9"h.
Adorable and perfect for storing anything from swaddle blankets to toys and everything in between. The only reason I deducted one star was that some pompoms looked sparse. Very cute for a nursery. It's quite small but perfect for some toys.